It’s pretty evident that we live in an age where technological innovation is everywhere. In the appliance industry it is safe to say that the majority of household appliances have technological components. For example, most dishwashers sense how dirty the dishes are and adjust the cycle duration accordingly. Most front-loading washers sense how full the laundry drum is and adjust the water level and duration, and many high-end ovens come with a temperature probe to cook your food until it is cooked through. The following products take it one step further. Imagine having appliances that are able to detect and possibly diagnose a service issue, or even let you browse the internet on your oven interface. 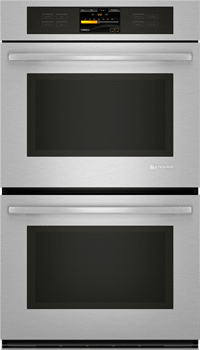 Many of these high-end double wall ovens have many features in common: third element convection, a culinary center with pre-programmed oven modes for common recipes, and many come with a temperature probe. In this article I will discuss the differences between these technologically innovative models. Bosch is an affordable luxury brand owned by the BSH Corporation. It is the sister brand to Thermador and Gaggenau, two of the most luxurious appliance brands in the industry. Bosch has a solid service history in our company. They make some of the best dishwashers and compact laundry in the industry, and their wall ovens and cooking products are also very popular. 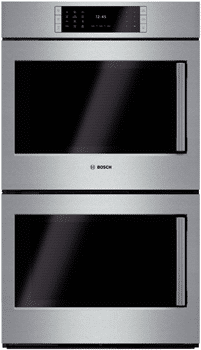 This year Bosch is releasing a full line of cooking products, refrigerators, and some new dishwashers at the higher end. The premium products in this lineup are part of the Benchmark Series. One of my favorite pieces coming out of this line is their wall ovens with a side-swing door. If you think about it, every oven should have a side-swing door because it gives you better access to the oven. The Benchmark ovens will also be available with a pull-down door, hence the two pricepoints in the header. From a technological prospective these ovens offer a color TFT display with touch controls. It has 14 specialized cooking modes to take the guesswork out of cooking common dishes, a temperature probe and a no-preheat option to save you time cooking dinner. One of the most unique features of this oven is the EcoChef Mode. This mode delivers energy efficiency by cooking for a short period of time and uses heat in the oven cavity to finish the cooking process. Keep in mind that this oven mode might take longer than traditional oven modes. LG is an affordable luxury appliance brand manufactured by LG Corp, one of the largest multinational conglomerate corporations in South Korea. Due to LG’s prominence in the electronics industry I am not surprised that LG manufactures a technologically incorporated wall oven. To be entirely honest we do not sell a lot of LG products. This oven has some cool features. Its menu-driven system has 42 pre-programmed recipes stored in the oven to take the guesswork out of cooking. Jenn-Air is a premium appliance brand owned by the Whirlpool Corporation, the largest appliance corporation in the world. They manufacture a full line of product including ranges, microwaves, refrigeration, and dishwashers. Jenn-Air is one of our top selling luxury brands due to a strong service history, fit and finish, and great package promotions. I think this is the most user-friendly oven control. The control panel is a 7’’ LCD display. What I like about this interface is that it is advanced, but not over-the-top. My favorite features are the convection conversion feature (takes the guesswork out of converting old family recipes to convection cooking) and "my favorites" which allows you to store the oven modes for your favorite dishes in the oven. This oven also has a “no preheat” option saving you time in the cooking process. This oven also has dual-convection fans which evenly distributes heat throughout the oven.wall ovens. It took me about a 3 minute tutorial on the control panel and I can operate it like a pro. Miele is a premium appliance brand that has some of the highest quality control in the industry. All of their products are designed, assembled, and manufactured in Germany. For this reason Miele has one of the best reputations in our service company. Miele is best known for manufacturing dishwashers and compact laundry, but their line includes one of the best vacuum cleaners I have ever used, and some great cooking products. Historically, Miele produces some of the most reliable appliances in the industry. Their new M-Touch ovens will have a TFT diaply control panel which will help you navigate through the MasterChef Gourment Center with 100 pre-programmed popular dishes. 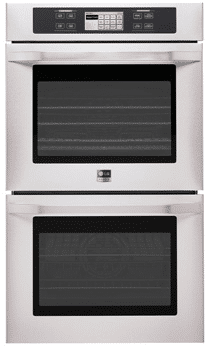 This oven also has dual-convection fans for even cooking, my favorites setting to store your favorite oven programs and a rotisserie that can be used as an accessory. This oven also has some features that are really unique. It has a water reservoir that can release bursts of steam throughout the cooking process (great for baking bread), and a crisp function removes moisture from the oven (great for making pizza). The temperature probe for this oven will be wireless and will work in coordination with the MasterChef controls to ensure food is cooked to perfection. 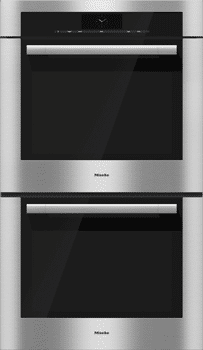 Coming up later this year Miele is expected to incorporate their Remote Vision Modules into the oven. These modules, now available in high-end dishwashers and refrigerators are linked to Miele and can detect a service issue and send your smartphone or tablet notifications. I like this feature because it will save you time trying to diagnose a service call. Dacor is a premium appliance brand that has been newly introduced to our showroom. 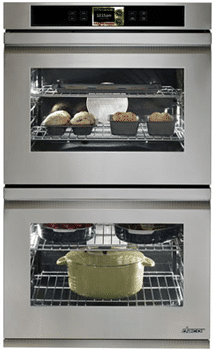 Dacor is a family-owned appliance company specializing in cooking products. They are known for innovative features and pioneered the concept of the 30’’ built-in wall oven, and true third element convection. Their line of appliances also includes ventilation, refrigerators, dishwashers and microwaves. This oven is the most technologically advanced appliance in the industry. The 7’’ touch-screen is essentially a tablet designed by Samsung. Like the other ovens out there you can use preprogrammed oven modes for virtually any dish you can think of. You can also store your favorite modes in the oven. You can use applications like Pandora (to listen to music while you cook), watch your shows on Netflix while you wait for dinner to be done, or even get your online holiday shopping done while you make cookies. I especially like the flexibility of the interface and the amount of things you can do on it. This oven can also self-diagnose service issues. 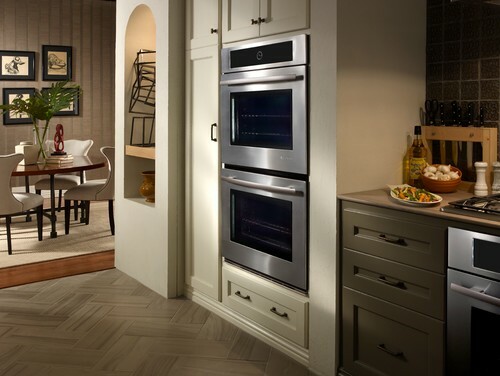 If you think your oven is not operating correctly, Dacor can diagnose a service issue from afar to assess what is wrong. I also like that you can operate the oven remotely from your smartphone or computer with Bluetooth Technology, so you can start preheating the oven for dinner from the office before you travel home. From a functionality standpoint Dacor is known for pioneering the idea of true third element convection. It also incorporates a steam-cleaning feature where you can pour water into the bottom of the oven and heat the oven with steam for easier cleaning. This oven has a hidden bake and hidden broil elements, a digital temperature probe, and 7 different rack positions in the oven. There are two small drawbacks that I can think of: in an age where everyone has multiple devices for remotely accessing the internet, the wall oven can only be remotely connected to one device. As someone who grew up with the development of the technology we know today I am fascinated by these ovens. Even for those who are skeptical, the technology can help save you time, especially on the Miele and Dacor ovens that can help diagnose a potential service issue. I also like the concept of the menu-driven system to help with cooking. These wall ovens can also walk you through cooking a variety of dishes useful for anyone who is an adventurous eater but an inexperienced chef. I think that if I had an oven with a culinary center I would spend less money out at restaurants and try to cook some unique dishes at home. On the horizon, Jenn-Air, Thermador, Wolf and Gaggenau are expected to release new technologically enhanced ovens in 2015. We will update this article with new updates. Download the Yale Appliance Wall Oven Buyers Guide with features, specs and the inside tips to all the brands. Well over 100,000 people have read a Yale Guide.